Erik wept into his father’s shirt as Finnar’s strong arms held him close. Erik hadn’t realized it before, but he’d assumed Finnar was dead. Erik wiped away his tears and tried to look calm, as if half the group—Kari—wasn’t watching him. “Are you a Brandrinn?” Erik said, realizing that Finnar had spoken to the Brandrinn with great familiarity. “How did you find us?” Kari said, stepping forward. Somehow she’d never been intimidated by Finnar. Erik took her hand, and she squeezed back without taking her eyes off his Da. “You did not tell your son the prophecy?” the dark-skinned Brandrinn said, skeptical. “You should have,” the Brandrinn said. Finnar grunted. He put a hand on Erik’s shoulder and looked into his son’s eyes. “The Brandrinn are servants of the forest. The forest is the lifeblood of this land. It’s our job to protect it. But the prophecy says that the Mother’s need for us would come to an end, some day. It makes sense, I suppose. Nothing lasts forever.” Like Bjarheim, Erik thought. “Well, I do.” Erik held out his hand and made a purple glow, and then a green one. Harmless, tiny lights, but somehow they still made all the Brandrinn—even Finnar—draw back a little. “You do.” There was something tight in Finnar’s voice. Pride? Could Finnar actually be proud of Erik? And if so, for what? For stumbling around and not getting killed? Some accomplishment. “Remember? Those were my favorite, when—when I was little.” It was the only time Erik had ever felt close to Finnar. His Da would come in at bedtime and tell Erik tales of Thor, Baldur, and Váli, the mighty sons of Odin. “They’re no stories for girls,” Sannfred Fray said abruptly. “Baldur said, ‘We will, father.’ Thor and Baldur and Váli left Valhalla, and left Asgard, and traveled to Niflheim. They reached the great gate of Niflheim, with its door of coldest ice. They pounded on the door, Thor with his hammer, and Baldur with his staff, and Váli with his bow, and demanded entrance. “Thor scowled at Nithogg, and struck at the frozen door with all his might. But even his great hammer could not shatter it. “Baldur scoffed at Nithogg, and attempted to pick the lock on the gate. But even with his great wisdom and knowledge, he could not open it. “Váli glowered at Nithogg, and attempted to vault the gate. But even with his great agility, the gate was too high, and he could not hurdle it. “Nithogg laughed. He said, ‘You are weak,’ and retreated into his domain, to torture the souls of warriors trapped there. Erik fell silent. What was it supposed to mean? Erik had always taken it as some kind of moral fable, to not value strength or wisdom or cunning above all else. He’d never felt that he had a surplus of any of the three, though. “Because they are cloaking themselves from you,” rang a voice from the tunnel. Aiar lurched up out of the hole, sweating and looking… frightened. “I told you not to enter!” Ollemar shouted, alarmed. “What is a fae doing here?” Emuar said, whipping his staff around and adopting a fighting stance. Ollemar gazed out at the ring of pines that encircled the Vângr. Erik saw the green energy still flowing between the trees, but as he watched, something seemed to strike against that barrier, sending crackling waves of light flowing into the Vângr. Erik perceived a distant ringing, as if a colossal gong had been struck. “That… should not be happening,” Finnar said. He took a step back, unconsciously shielding Erik. “It isn’t possible!” Emuar wailed. The distant gonging sound came again, and another wave of crackling green light sputtered from the trees. Erik looked up. The very uppermost branches were withering. “What do we do?” Erik shouted. Emuar had fallen to his knees and was clutching at his chest; several of the other Brandrinn had followed suit. Something was hurting them, just as it was hurting the wall of trees encircling the Vângr. Ollemar, alone among them, kept his feet. And Finnar, of course. “We must restore the shield,” Ollemar said. “Brothers! Come, you must!” He tried to lift Emuar to his feet, but the dark-skinned Brandrinn tore his arm away and fell back, shrieking. “Why can’t they help?” Erik shouted. “Can’t you do it?” Erik said, near tears. How could his Da expect him to handle something like this? Finnar shook his head. “My magic is long gone. When I left the forest, the magic left me. It was… Now is not the time. Come on!” He took Erik’s arm with one enormous fist, and Ollemar’s with the other. The young Brandrinn, so arrogant in the past, quailed and let himself be dragged along toward the wall of trees. Nobody else followed, except Kari, of course. “No, go back,” Erik said when he noticed her. “Like the hells I will,” she snapped. “Even if I can’t help, I ain’t leaving you alone to that.” She was pointing up at the wall of trees. Erik looked. The branches, high up, had turned to ash, fluttering away in the wind. Dark tendrils probed between the trunks. Something was going to come through before long. Erik gulped. He had no idea what was going to happen. He sought the little green light that nestled inside his mind. The violet one was there too, pulsing in quiet counterpoint, unaware of the Shadow lurking yards away, waiting to devour them all. Erik ignored the violet light—the fae magic would do no good here, would it?—and focused on the green. As Ollemar stepped forward, Erik pushed the green ball out into the air before him. “Do… do what you have to,” he said. Ollemar took his staff and waved it in the air before Erik’s face. The pattern made no sense to him at first, but then he began to see it: an intricate weaving in the space where the tip of the staff passed, trailing faint green light behind it. The green ball floating before Erik began to glow brighter, and elongate, like a baker stretching dough out for long loaves. The brightness grew and grew, making Erik squint and then avert his eyes completely. It was like trying to look at the sun. “By the gods,” Ollemar said as he continued his weaving. Erik forced himself to look back. The pattern woven in the air before him was astonishingly bright, but Erik realized that it was not just green. Tendrils of violet light had woven themselves into it, creating a tapestry in the air that made the earlier weaving look like a child’s idle play. The edges of the shield unfolded, growing ever larger and more detailed, delineating runes of power that pulsed with purpose. Finally Ollemar dipped his staff right into the center of the shield, and with a mighty grunt heaved his staff upward. The whole shield shattered into a million numinous fragments, embedding themselves in the great trees. 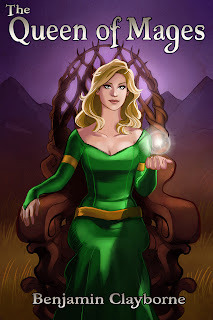 The fading green light of the Brandrinn’s old shield was replaced by a radiant brocade of emerald and amethyst. 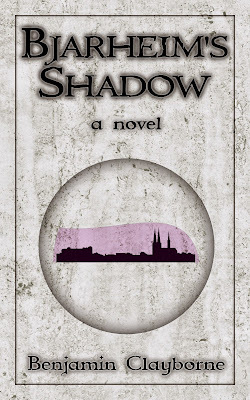 The Shadow, just beginning to seep its way through into the Vângr, vanished with a shriek. The tops of the trees were still ash, but the corruption had stopped. “It… it shouldn’t be possible…” Ollemar pushed himself upright and strode over to the trees. The Shadow’s probing tendrils had made it seem as if there were colossal gaps between each trunk, but now you couldn’t blow a breath of air between them. “The others!” he said suddenly, and ran back toward the center of the Vângr. Erik loped after him, Kari and Finnar on his heels. Erik went over to Aiar. The fae still clutched at his arm. The black smoke that had been roiling off it had stopped, but Erik spied angry red blisters beneath his fingers. “Are you all right?” Erik asked. Erik threw his arms around her and squeezed. She yelped surprise, but did not break away. Erik was so glad that someone here was concerned with practicalities, rather than bloviating about magic. They all seemed so convinced that he’d made the shield, when all he’d done was stand there letting Ollemar do all the work! But now everyone, save Kari, was eyeing him with some mixture of awe and fear. Erik the sorcerer; Erik the mighty, came a voice in his head. I’m no such thing! he argued at himself. The voice cackled.